milk_shake® offer a fantastic portfolio of products that include a range of shampoo, conditioner, intensive hair treatments and hair styling products that will all become the perfect additions to your daily hair care routine. New to Vibrant Salon Fredericton, a full line of men's hair products, including shampoos, conditioner and 4 different types of pomades. 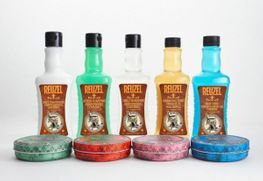 Reuzel grease in the green can is a beeswax based, medium hold pomade. Its as sticky as honey and will pomp up or slick down every classic or signature haircut. The traditional pomme fragrance has been spiced up with a little peppermint in Reuzel traditional grease. Reuzel pomade in the red can is a water based, high shine pomade with a subtle scent of cola. Reuzel pomade rinses out easily but holds hair like super glue and shines like a fresh coat of paint on your favourite vintage car. NEW AT VIBRANT SALON, Every Moroccanoil product contains antioxidant-rich argan oil. As the leader and pioneer in argan oil-infused beauty products, all of the products are oil-infused, offering a unique approach to hair care and styling that not only leaves hair naturally smooth and shiny, but also improves its condition with each use. 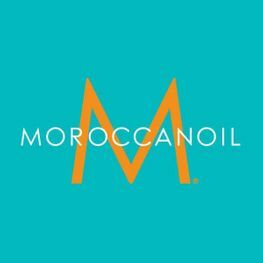 The Moroccanoil brand has become an industry sensation that is embraced by celebrities, runway stylists and women all over the world. Now, it is with great pride that we introduce a line of body care products to Fredericton that offer women simple and effective solutions for everyday use. We invite you to try Moroccanoil body products and experience the luxury and performance for yourself. Quannessence produces the highest quality products by taking the most advanced ingredients from nature and combining them into products that will exceed the expectations of everyone that uses them. Quannessence Skincare is based on five guiding tenets that reflect the philosophy of the company’s approach to everything they do. 1) Safe Healthy Products: No matter what products we produce, the most important principle that guides us is that they must be safe and healthy for the skin. 2) Functional: Every product we produce must have proven results and be considered among the best our clients have ever used. We will not use ingredients for label appeal, with all ingredients being used at optimal concentrations. 3) Natural: We base our line on natural ingredients and, wherever possible, use plant derived extracts with a proven history of safety and functionality. 4) Treatment Based: All our products form part of advanced professional treatments that can be performed by professional skincare providers and used in home-based treatment regimens. 5) Cost Effective: Our products are formulated to be extremely cost effective by maximizing potency so only small amounts are used, thereby ensuring maximum value for our clients. Footlogix is the world’s first and only PEDICEUTICAL® Mousse Foot Care line – made with pharmaceutical-grade ingredients – developed by Katharin von Gavel, one of North America’s leading authorities and true pioneers in Pedi-CARE. Scientifically formulated, Footlogix’s unique groundbreaking Dermal Infusion Technology® enables active ingredients to penetrate faster and deeper into troubled skin of the feet. With results seen in a mere few days, from eliminating simple dryness to addressing more severe conditions resulting from Diabetes, Footlogix has been clinically proven to perform. Trusted by millions of feet in over 20 countries, Footlogix Pediceuticals® have provided the healing solutions demanded by renowned professionals and their clients around the globe! 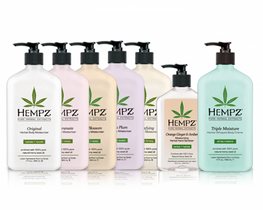 One of our favorite products is the HEMPZ body lotion. HEMPZ contains pure natural hemp seed oil, one of natures richest source of essential fatty acids. It will heal, renew and reduce fine lines. At your next service with us, try out the limited edition Goji Orange Lemonade lotion. Discover shampoos, conditioners, hairsprays, and hair treatment systems we know you’ll love. From brand new to best-sellers, these are our haircare favorites! Pureology's sulfate-free, dual-benefit formulas are 100% vegan, and designed for maximum hair color protection. Pick one of our best-selling shampoos, conditioners, hairsprays, and hair treatment systems! Feel luxurious with our 100% vegan, sulfate-free formulas that are here for all your color protection needs. Matrix's Biolage hair care products are enriched with unique botanical extracts and designed to target specific hair needs. Biolage Fiberstrong Shampoo was formulated to target these needs with the power of Intra Cylane plus bamboo and ceramide for repairing damaged, fragile hair. When used with the Fiberstrong Conditioner and Intra-Cylane Fortifying Cream, your hair is stronger and more conditioned. All Soft Shampoo, Conditioner, Hair Cream, Hairspray and Argan-6 Hair Oil for dry, damaged and brittle hair by Redken. Moisturizes, strengthens & rebuilds hair. Our sulfate-free hair colour protecting shampoo is a lightweight, gentle, conditioning & cleansing shampoo that uses Redken's IPN technology and amino-ions to leave your color treated hair 3x more fortified. 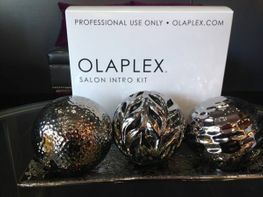 We are very excited to now be an OLAPLEX SALON! Go Blonder. Push the envelope further without compromising the integrity of hair. Have the hair colour that you've always wanted. Olaplex is a 3 step treatment that links broken bonds in the hair during and after chemical services making them stronger than they were before. Feel free to send us any question that you may have about Olaplex. We look forward to giving you your most beautiful and strongest hair ever. High-performance foundations, eye shadows and makeup brushes to help achieve perfect, runway-ready looks. We do makeup touch ups and professional application in our spa/salon. This brand-new method is a showstopper. Installation is astonishingly fast and the look is shamelessly seamless. 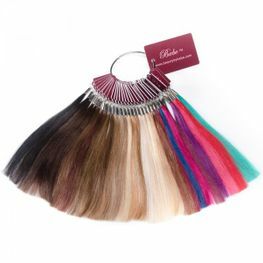 Clients are raving about how Babe Tape-Ins provide length and volume and blend easily into hair. 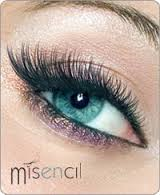 Since its inception in 2006, Misencil became a major player in the beauty industry and the world's eyelash extension material. This is in Terrebonne, a suburb of Montreal, that emerged brand. A collaboration of a couple on the lookout for trends and passion for aesthetics, Jean-Jacques Benguigui and Ingrid Gagné, Misencil quickly aroused enthusiasm in spas, beauty salons and with cosmeticians worldwide with over 5000 locations today.